Permanent lung damage caused by chronic obstructive pulmonary disease (COPD) starts much earlier than previously thought, even before patients are showing symptoms, according to research by the University of British Columbia. The discovery, published this month in The Lancet Respiratory Medicine, could dramatically change how patients are treated for COPD, the leading cause of hospital admissions in B.C. and Canada. Tillie-Louise Hackett using the microCT scanner that was instrumental in the discovery about COPD’s early destructiveness. “If the same drugs were tested on patients with more mild forms of the disease, and less tissue damage, the results could be very different,” said Dr. Hackett, a principal investigator at St. Paul’s Hospital Centre for Heart Lung Innovation (HLI). Lung samples from 34 patients were analyzed using an ultra-high resolution micro-computed tomography (CT) scanner, one of only three scanners of this kind in the country. 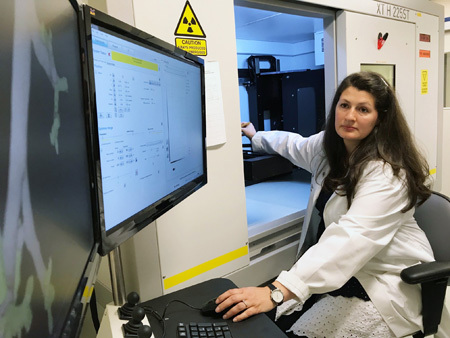 The HLI Lung Tissue Registry Biobank at St. Paul’s has been collecting specimens for more than 30 years, but the recent addition of the microCT scanner — funded by the Canada Foundation for Innovation and the St. Paul’s Foundation — made it possible to image samples that are embedded in paraffin in extreme detail. Professor of Respiratory Medicine Don Sin, the Canada Research Chair in COPD and a St. Paul’s respirologist, said the findings have significant implications. By 2020, COPD is expected to be the third leading cause of death worldwide.